Whenever I think of Indy Cars racing on Labour Day weekend, my Heart wanders back to multiple outings Up North Eh! At the Molson Indy Vancouver race, for which I've attended both circuit layouts and both series, nee Championship auto Racing Teams (CART) and Champ Car World Series (CCWS) events at the long forgotten temporary street circuit venues. And I'm not sure which memories I recall more? Attending the inaugural 1990 outing, ironically now scribbling 'bout it 27 years later. as Yuhs Tiafosi know the importance of the number 27, Eh! And although I cannot remember definitively when my last race was, I'm 'bout 86% certain it must have been circa '02, since that's the year the date moved from labour Day to late July. Champ Car sends Devoted Fan Fuming! Nineteen Ninety was the year that Thief's had finally successfully stolen my black Nissan 280ZX after a further three-tries; SHEISA! For which I went off to Vancouver, BC for that year's inaugural Molson Indy Vancouver CART race, thinking I'd never see my car again. Yet upon returning home, I'd be informed it had been "Dumped" at Cody's restaurant in Bellevue, WA. Which was the restaurant of the late Wayne Cody, one of the original Procostinators 'O Seahawks Football, which I've previously mentioned in my 'Ol Hollywood lore. As I'm not even sure how old it is? Other than I've had a framed Danny Sullivan autographed lithograph of 'Ol Sully's 1992 Galles Racing Molson livery Galmer G92 Chevrolet on the streets 'O Long Beach hanging in Tomaso Manor for an eternity now! While 1990 arguably was the race's darkest year, which I was sitting in the stands near the chicane, opposite side of the track where Ross Bentley stalled his Spirit of Vancouver entry, for which Willy T. Ribbs subsequently hit the corner workers coming to Bentley's aid! For which the four workers were unsighted to Ribbs do to the concrete "Jersey" barriers ringing the temporary street circuit. As sadly 22yr old corner worker Jean-Patrick Hein would die. But my happiest memory of attending a CART race Up North eh! 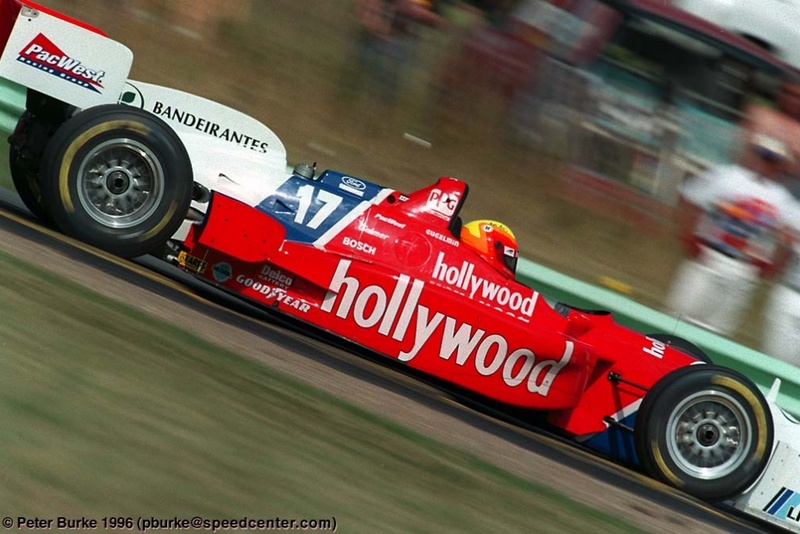 Without doubt is the '01 event, good 'Ol Awntie' Harriet's Debutante IndyCar race, where Roberto Moreno did multiple smoke laden "Zanardi Doughnuts" directly in front of us en route to victory lane! As I'd say that I enjoyed the original course's layout better, especially since we chose the grandstand at the west end nearest the course's "Hairpin" corner. But I also enjoyed the second course's layout, especially the "dog-leg" bend around Science World. Whilst I've got a strange memory of recalling the drivers on Thar introduction parade lap of being chauffeured in Dodge's', perhaps PickemUp' trucks? As why do I recall "Top Jimmy" (Jimmy Vasser) so vividly in a red with twin white stripes vehicle, eh? And even though I didn't attend that year's race, presumably watchin' I-T from Thy Couch? How can I not mention whom Bob named "googly eyes," Uhm, better known as BIG MO', nee Mauricio Gugelmin, who scored his lone IndyCar victory for my Home team's PacWest Racing squad Up North Eh! Oh KanaDuhs' produced some memorable IndyCar talents, primarily during the CART era when alcohol and cigarette sponsorships funded several drivers and teams. Having found the following eight drivers participating up to the end of CART in '03. Scott Goodyear, (1987, 1989-2001) appears to have led the Frozen Tundra; Err Maple Leaf charge, for which I always fondly remember those Walker Racing cars emblazoned in McKenzie Financial colours. PT', aka Mr. Chrome Horn, nee Paul Tracy, thee Thrill from West Hill (1991-2011) began his long, illustrious Open Wheel Racing career for none other than El Capitano', aka Roger Penske. Tracy took a one year Sabbatical from Roger with rival Newman Haas Racing in '95 before returning to Penske a further two years. Then moved onto Team Kool Green, where he was always a force to be reckoned with - before winning his lone championship for Gerald Forsythe during CART's final year before becoming insolvent. Yet Tracy, arguably Oh KanaDuhs greatest Open Wheel Racing warrior, lacks one thingy' that only Countryman, one Crazy Kat I nicknamed Jack Vanilla, then subsequently Jacks Oh Lantern', i.e. ; Jacques Villeneuve (1994-95) has. Can Y'all guess What's Dat? Uhm, Uh-huh, the Borg Warner trophy from '95.., to go along with his CART/PPG Championship before departing for Formula 1. And let’s NOT forget the late, great Greg Moore. (1996-99)Arguably KanaDuhs favourite son! Who won five times in those iconic blue & white Team Players (Forsythe) Indy Cars before his tragic demise at Fontana on Halloween. Another somewhat overlooked? Kuhnaidiun driver, albeit a Fan favourite was Pat the Carpenter (Patrick Carpentier: 1997-2005) who won Rookie Of the Year (ROY) honours for the late Tony Bettenhausen's squad before joining Moore as team-mate the following year. And last, but certainly not least to the party was TAG', nee Alex Tagliani, (2000-2016) this affable Quebecer' had the dubious pressure of taking over Greg Moore's seat at Forsythe as a rookie, followed a season later with that horrific collision with El Zorro', aka Alex Zanardi at the Lausitzring! Vettel re-ups at Ferrari, Hamilton next?